So, I love cheesecake. And in my downtime, I shamelessly watch a lot of YouTube videos, focusing mostly on Buzzfeed, and more specifically, their Tasty Videos. Now Buzzfeed’s Tasty (from what I can glean from watching their videos) is a bunch of cooks and chefs that pump out videos about FOOD. All the food. They do sweet, savoury, quick, slow, and all the food hacks you might ever need. One of my favourite videos, and one of the most intriguing, was this fluffy Japanese cheesecake. It looked AMAZING. Tall, fluffy, soft, dark top, light sides…. It just looked great. So when I saw it, I was immediately interested because of Paul. You see, I love cheesecake. Love it. But Paul? Not so much. He is not a huge fan of the texture of cheesecake (but I still love him! Everyone has faults! Ha! ), so I began thinking about whether or not he would like this specific cheesecake. Because it has so much less cream cheese, and so much more meringue and air in it, I knew that the texture would be a whole different ball game. There was a chance I could be successful! Oh my word, guys. The only thing I changed from the recipe was add about a half-teaspoon of lemon extract, because I wanted the cheesecake to have a little bit of flavour. Line the bottom and sides of a springform pan or 3 inch tall cake pan with parchment paper. (If the parchment paper is curling badly, I’ll rub a TINY amount of margarine on the side of the paper that will face the pan edges.) Set aside. If you use a springform pan, wrap the bottom in 2-3 layers of aluminum foil to keep out the water. In a medium saucepan, combine the milk, cream cheese, and butter on medium heat, and whisk until smooth and combined. Take off the heat and let cool. In a large mixing bowl, whisk together the egg yolks until incorporated. Slowly whisk in the cooled cream cheese mixture until incorporated and smooth. Sift in the flour and cornstarch, and whisk again, making sure there are no lumps. If using lemon or vanilla extract, add to the yolk mixture, and whisk again. In the bowl of a mixer fitted with a whisk attachment, beat the egg whites until soft peaks form. Slowly start adding the sugar, a little bit at a time, and whip on high until stiff peaks form. Add ¼ of the egg whites to the egg yolk mixture, and fold in gently with a spatula, until you have a cohesive batter. Be gentle, because we want to keep the air we just beat into the batter! Repeat with the remaining egg whites, until you have a smooth batter with all the egg whites combined. Pour the batter into the prepared pan. Tap once or twice, gently, on the counter to pop any large air bubbles. Use a baking pan or dish that is larger than the cake pan you are using, and place two paper towels on the bottom. Put the cake pan in the middle of the paper-towel lined pan, and fill with hot water, no more than an inch up the sides. An easier way to do this is place the baking dish in the oven with the paper towels and your cake pan, then add the hot water into the pan while the oven door is open. This reduces the risk of hot water burns. Bake in the preheated oven for 25 minutes, then turn down the heat to 280°F, and bake for an additional 55 minutes. Remove from the oven, and carefully, invert the cake onto your dominant hand to remove it from the pan, and take the paper off, then revert back onto a cooling rack. Sprinkle icing sugar on the top of the cheesecake for garnish. Slice, and enjoy! Many people say to enjoy a slice of this warm or cool, so it’s your choice! Oh, you read that right. Chai Cheesecake. Dreams do come true, especially tea dreams. This past week we had “off” from school. I say “off”, because teachers never really get the Family Day week off. There is always Teacher’s Convention to go to, and I was gone four full days at convention. Luckily, the convention was in Calgary, and I got to stay with my fabulous brother-in-law, and his amazing wife Serena (who is an avid blog reader, and probably one of my biggest fans. I’m so lucky.) P.S. Serena, this shout-out and this post is for you, beautiful lady! Whenever I visit, Serena and I talk about a few things. Some of the most important things we discuss are: a) tea, b) baking, c) my blog (as I said, Serena is a huge fan! ), and d) her beautiful paintings! I feel like we just click, and we are kind of kindred spirits… it’s wonderful! I got the idea for this recipe from Serena, but a quick Pinterest search yielded this recipe. I did take a few liberties and change the recipe a bit, so this is technically an original recipe… Hooray! I took out the chocolate, changed the crust, and added a Chai whipped cream to take the warm spice blend to a whole new level. Also, Serena and I both have a Chai spice blend, which is amazing, however, just in case you lovely readers do not have a Chai spice blend, I will put in measurements for that. If you are a cheesecake fan, or a Chai fan, make this as soon as you can!! Place a loaf pan full of warm water in the cold oven. (If you use a water bath for your cheesecake, skip this step.) Preheat oven to 350°F. Line the bottom of a springform pan with parchment paper. If making your own Chai spice, whisk all spices together in a small bowl and set aside. In a medium mixing bowl, combine the melted butter, crushed gingersnaps, and sugar. Press the mixture into the lined springform pan, and pat down into an even layer. Bake in the preheated oven for 10 minutes. In the bowl of a stand mixer, combine the cream cheese and sugar until fluffy. Add eggs, one by one, then add in vanilla. When well combined and smooth, add in the Chai spice and the whipping cream. (If you made your own, only add in 3 tsp. of Chai spice, and save the rest for the whipped cream.) Once batter is smooth and spice is well-incorporated, pour into the prepared pan. Bake in the preheated oven for 50 minutes, (in a water bath if using) then turn the oven off and let cheesecake cool to room temperature in warm oven. After the cheesecake cools to room temperature, take out of the oven, and move to the fridge to cool completely. While the cheesecake is cooling, in the bowl of a stand mixer, combine the whipping cream, icing sugar, Chai spice, and vanilla, and whip on high until soft peaks of whipped cream form. Spread the whipped cream over the cooled cheesecake, then remove from the springform pan, slice with a hot knife, and serve. Store in the refrigerator. Hello friends! I’ve been extremely busy lately, with the ending of the first semester of school, exam week, marking, planning for the second semester of school, and moving my classroom. Thank you for being so patient with me, I promise this cheesecake is worth it. As some of you may know, before starting teaching, I spent 8 years working in the restaurant industry. The last restaurant I worked for, Moxie’s, a well-known chain up in Canada, had a dessert almost identical to this one. However, for a recent staff meeting, I decided to make my take on the Salted Caramel Pecan Cheesecake. This recipe is two recipes amalgamated together, as well as my own few touches… therefore, I consider the final recipe all mine. I’ll still link to the original recipes I used, but I’ll post my “changed” recipe below. I used the crust recipe from here, and changed it. This is the filling recipe that I used, again, changing it as I needed it. I will let you know, all you health-conscious people out there – this recipe is gluten-free! My principal is actually unable to eat gluten, and I really wanted to make cheesecake, so I took a page out of the Moxie’s playbook and decided to make the crust of the cheesecake out of pecans. Because I was never in the kitchen of Moxie’s, I never knew the recipe, so I found one online and went with that, adding in my own touches here and there. I was SO sad, because I forgot to take a picture of the whole cheesecake, and I was so proud because the cheesecake didn’t even crack! 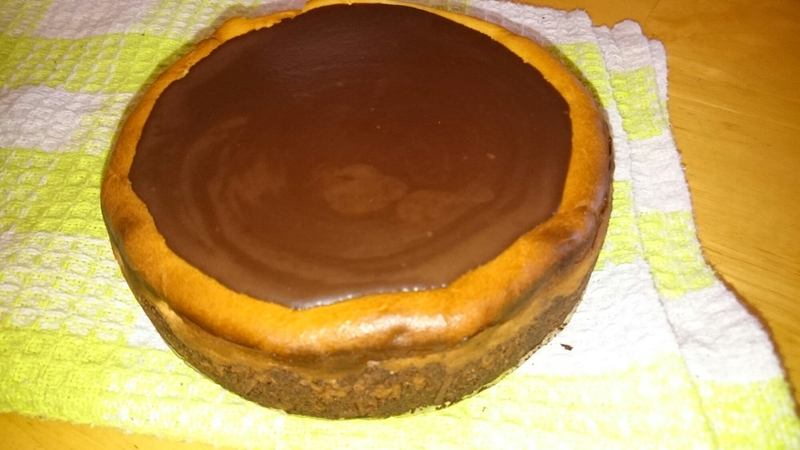 Usually, because my oven is old and temperamental, any cheesecakes I make end up cracking, but this one didn’t! It was so beautiful and I’m mad at myself for forgetting… Oh well… Next time! P.S. This cheesecake was awesome. I rarely make cheesecake, because when I do, I’m the only one who eats it (unless I give it away). This one was DECADENT, but incredible. It was perfect. To make the salted caramel, have the cream, butter and salt ready to go near your stove. Make sure the cream and butter is room temperature, and the butter is divided up into tablespoons so you can add a tablespoon at a time. Place the sugar in a medium saucepan. With the heat on medium-medium high, stir sugar constantly with a wooden spoon or a heat-resistant rubber spatula. Sugar should start to melt, and become a deep amber colour. Keep stirring, and do not let sugar burn. When all the lumps have melted, turn the heat down to low and add the butter, one tablespoon at a time, adding the next tablespoon when the first one is melted. It is very important – STIR THE CARAMEL CONSTANTLY. Once the butter is incorporated,take off the heat and add the cream and the salt. **If the caramel starts to seize up when adding the cream, the cream was too cold! Make folding motions (as if to “fold in” the cream) if this happens, keeping the caramel moving. Do this until the cream becomes incorporated into the caramel, and you have a thick sauce. Transfer caramel to an air-safe container, and let cool. Caramel will thicken more as it cools. To make the cheesecake, preheat oven to 375°F. Line a springform pan with parchment paper (the bottom and sides), and set aside. In a medium bowl, combine the pecans, sugar, and salt, and toss with a fork to combine. In a small, microwave safe bowl, melt the butter and add to the pecans. Toss to combine, then press into the prepared springform pan. Bake in the preheated oven for 15 minutes, then let cool on a wire rack while you prepare the filling. Lower oven heat to 325°F. Fill 1-2 metal loaf pans or roasting pans with warm or hot water, and put in the lower rack of your oven. In the bowl of a mixer fitted with the whisk attachment, add the cream cheese and beat until fluffy. Add the sugar and eggs, one at a time, and beat well. Add in the sour cream and heavy cream, and beat again. Finally, add in the salted caramel. Add in amount of salted caramel to your personal taste. 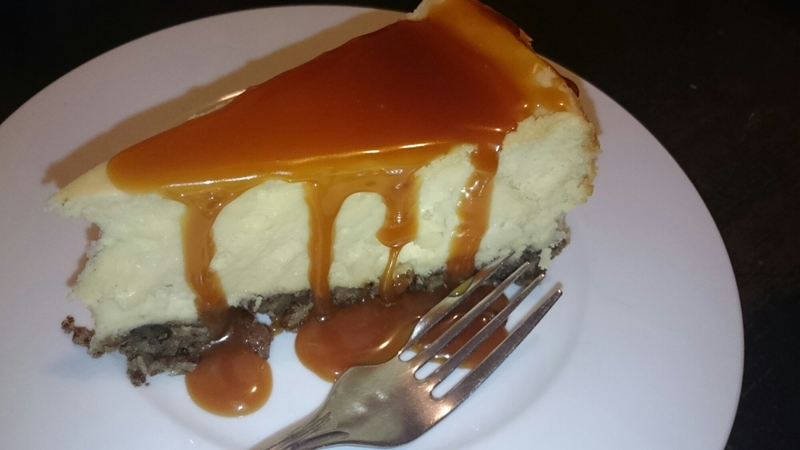 I added half a cup in first, then added a bit more because I wanted a stronger caramel flavour in the cheesecake. Beat all ingredients so that caramel is incorporated throughout the filling and filling is smooth, not lumpy. Pour cheesecake filling into springform pan. Place pan in preheated oven (on the middle rack). Bake for 1 hour 20 minutes, then turn the oven off. Leave the cheesecake to finish cooking in the warm oven until the cheesecake is room temperature. Transfer cheesecake to refrigerator, and chill completely before slicing with a hot knife and serving. 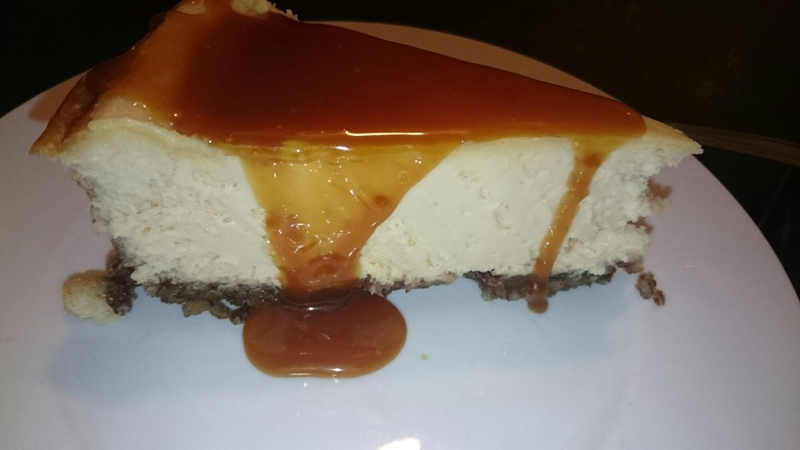 Garnish cheesecake with leftover caramel sauce. Oh…. yes. This is a real thing, and it is absolutely AMAZING. Almond is another flavour that is so beautifully subtle, but it can stand alone phenomenally. 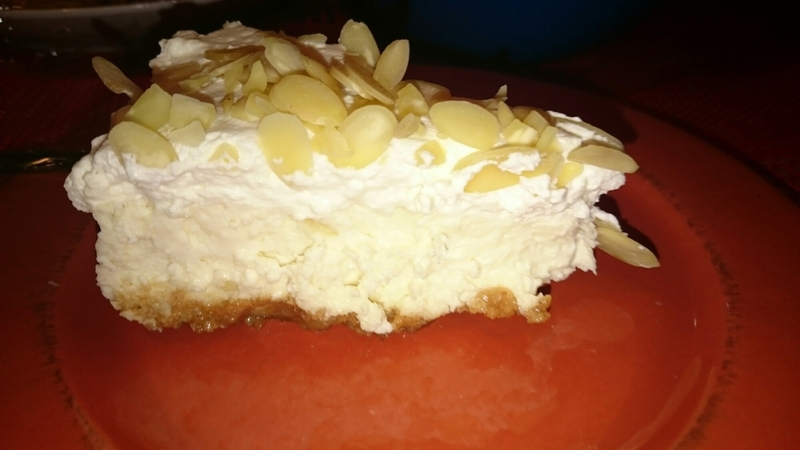 Add in some almond, some alcohol, and some mousse to a cheesecake, and you have this gorgeous Amaretto Cheesecake. I found this recipe on Pinterest… how I love Pinterest… but it led me back to the wonderful Life, Love and Sugar. She made this cheesecake originally, and it is SO GOOD. Incredible. 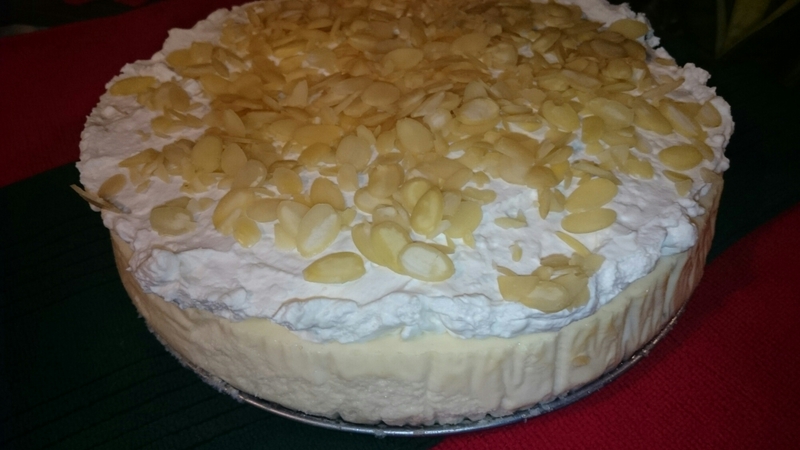 An amaretto-infused cheesecake, topped with an amaretto spiked mousse, and decorated with slivered almonds. This, my friends, is the almond/amaretto trifecta. I don’t make cheesecake very often, for a few reasons. First, Paul is not the biggest cheesecake fan, so I end up being the only one who eats any, and I can only eat so much cheesecake. I usually end up giving a bunch away. Secondly, cheesecake is so rich, I can’t always eat a lot at a time. I mean, I love cheesecake, and I love how rich it is, but you can’t eat a ton of cheesecake without feeling a little sick from all the rich deliciousness. Either way, though, this cheesecake is AMAZING, and if you are a fan of amaretto or almond, make this cheesecake. If you aren’t much of a booze drinker, you can always substitute the amaretto for a teaspoon or so of almond extract. Place a loaf pan filled with water in the oven and preheat oven to 325°F. Line the bottom and sides of a springform pan with parchment paper. In a small bowl, combine the crust ingredients and press into the bottom and up the sides of the springform pan. Bake crust for 10 minutes, them remove from the oven and let cool while you make the filling. Reduce oven temperature to 300°F. For the filling, in the bowl of a mixer fitted with a whisk attachment, combine the cream cheese, sugar and flour on a low speed until combined. Use a low speed so that you do not incorporate a lot of air into the batter, which can cause cracks. Add the eggs into the batter one at a time, beating and scraping down the bowl after each addition. Add in the sour cream, almond extract, and amaretto, and beat until smooth and well combined. Pour filling over crust. Make sure water level is still high in the loaf pan, and if a lot of water has evaporated, add more. Drop the springform pan lightly on the counter once or twice to remove any air bubbles. Place into the oven, and bake for 1 hour and 30-40 minutes. After at least an hour and a half, turn the oven off, and open the door for a second or so to release some heat. Close the door again, and let the cheesecake cool in the oven for 1 hour. Remove to a cooling rack, then let cool completely to room temperature. Once at room temperature, place in the refrigerator until completely chilled. When cheesecake has chilled, make the mousse. Combine the cream, icing sugar, and amaretto in the bowl of a mixer and whip until the cream forms stiff peaks. Transfer to a separate bowl, and add the cream cheese to the mixer bowl. Beat cream cheese until smooth. Gently fold whipped cream mixture into the cream cheese. Spread mousse over the top of the cooled cheesecake. This can be done in advance, or right before serving. 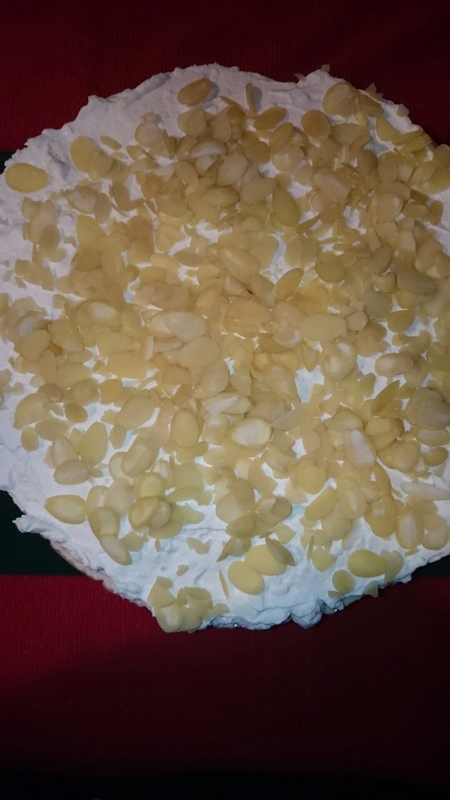 Sprinkle slivered almonds over top of the cheesecake. Remove from springform pan, remove parchment paper, slice and serve. Well, I have been looking at this Nanaimo cheesecake for a while now. It was originally brought to my attention by a dear friend, who requested I make her this recipe without coconut. I decided instead of making one large cheesecake, I would make four small ones. Three years ago, I bought eight small 6 inch cheesecake pans, and throughout heavy experimentation, I have figured out that one regular cheesecake recipe makes four small cheesecakes, and double the recipe makes the full eight mini cheesecakes. 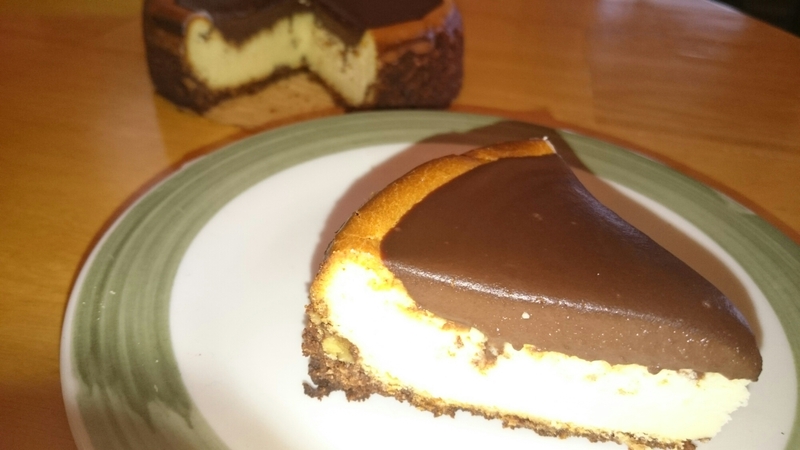 Either way, if you like Nanaimo bars, then you should probably give this cheesecake (and this recipe!) a try. If you have never had a Nanaimo bar, and are wondering what the heck a Nanaimo bar is, then I will tell you. First, the bottom layer is a mixture of cocoa, coconut, and walnuts. This is covered in a custard cream layer. Finally, a layer of chocolate covers the whole thing. 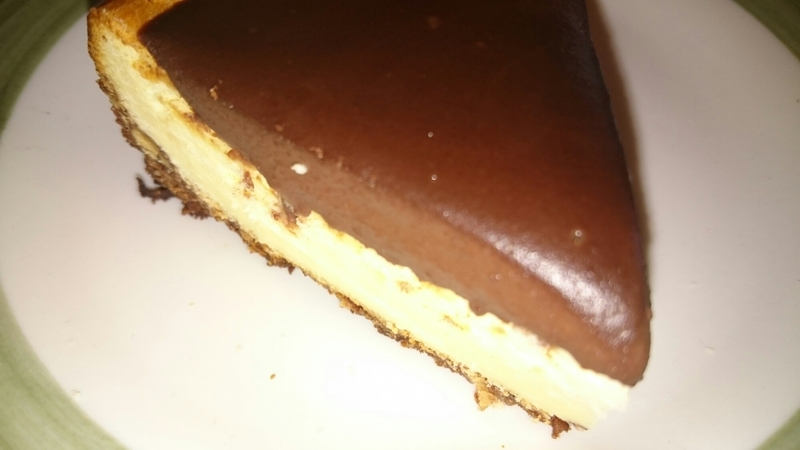 Above is a picture of a classic Nanaimo bar (the picture is not mine! ), and here in Canada, they are extremely popular. 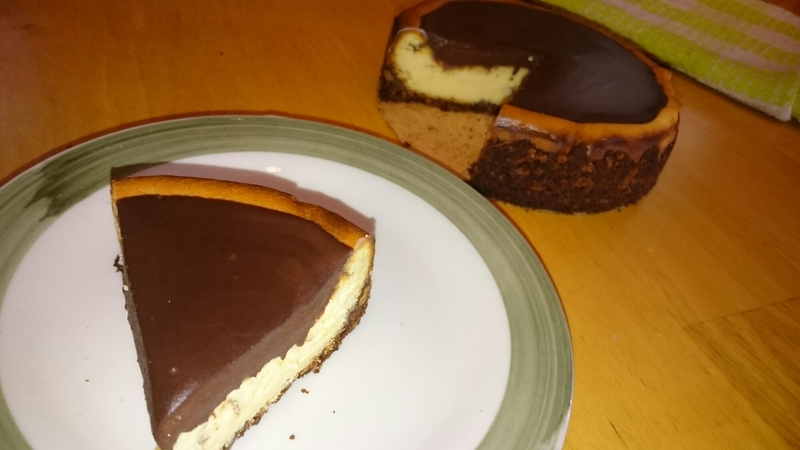 While Nanaimo bars are not my favourite dessert, I am a fan of cheesecake, so this recipe called to me. A layer of cocoa, coconut, walnuts and graham crumbs, topped with a smooth, creamy cheesecake base enhanced with with vanilla custard powder, and a silky, velvety chocolate ganache. Cheesecake is always a finicky thing to make, and I have found that smaller cheesecakes tend to crack slightly more than larger ones. However, here are a couple tricks to help minimize the cracking. Firstly, place a pan of warm water in the oven as you are preheating the oven. If you have to bake the crust before the whole cheesecake, place the pan of water in the oven as soon as you take out the crust. Make sure the water is warm or hot when you put it in the pan. Secondly, cheesecakes like to cook at a lower temperature for longer. Usually recipes say to cook cheesecakes for 45-60 minutes. One way to help stop cracking is to cook the cheesecake at the recommended temperature for no longer than 45 minutes. After that, turn off the oven, and crack it for a second to lose some of the heat. Then, close the oven, and let the residual heat finish baking the cheesecake for the last 15 minutes. After that, crack the oven open again, and let cool to complete room temperature. Finally, after cooling the cheesecake in the oven completely, transfer the cheesecake to the refrigerator and chill completely. After your cheesecake has chilled completely, if there are any cracks, soak an offset spatula in hot water and gently push the chilled filling together to seal the crack. When the cracks are repaired, chill again. However, back to the cheesecake! Take a chance on this recipe, and let it wow you! Preheat the oven to 350°F. Line the bottom and sides of a springform pan with parchment paper. Finely chop or grind the walnuts into a powder. Combine all crust ingredients in a medium bowl and mix until evenly combined. Press crust into the springform pan bottom and up the sides about an inch. Bake in the preheated oven for 5 minutes, and cool on a cooling rack while you make the filling. Place a pan filled with warm water in the lower rack of the oven. For the filling, in the bowl of a mixer fitted with the paddle attachment, beat cream cheese until light and fluffy. Add in the eggs, one at a time, beating after each addition. Scrape down the sides of the bowl, and add in the sour cream, sugar, vanilla and custard powder and mix until smooth and combined. Pour onto the crust, and bake 60 minutes, on higher oven rack above the pan of water. Crack the oven, and let cool to room temperature in the oven, about 2-3 hours. After cool, chill completely in the refrigerator. Fix any cracks if necessary. Once the cheesecake is completely chilled, place the chocolate chips in a medium bowl. Warm the cream in the microwave for 1½ minutes. Pour the cream over the chocolate, and let sit for 2 minutes, then whisk until smooth. Let cool until thick and smooth, then pour over the cheesecake, and refrigerate until set.